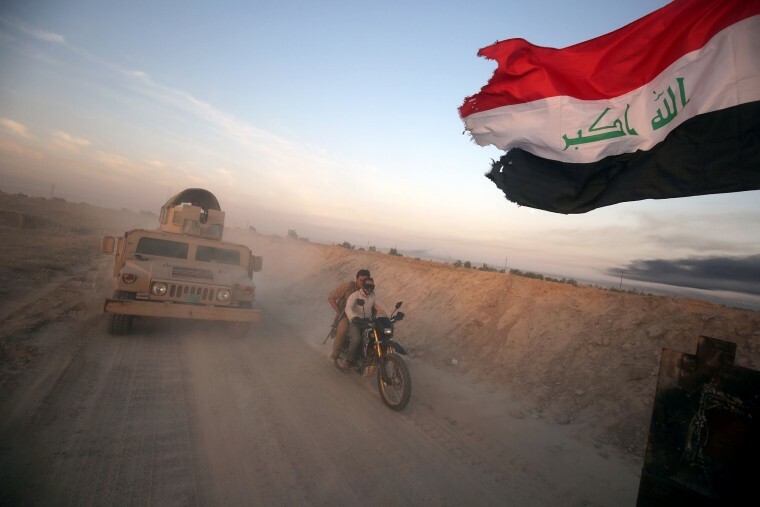 One day after launching an offensive to capture Fallujah from ISIS, Iraqi security forces had "liberated" 11 nearby villages and districts, a federal police commander told NBC News Monday. G. Ra’ed Shawkat added that ISIS fighters had been forced to retreat to the interior of the strategically important city, which is 41 miles west of Baghdad and has been controlled by the militant group since it swept across sections of Iraq and Syria in 2014. Last month, the United Nations and Human Rights Watch said that Fallujah's residents — whom ISIS has prevented from leaving — were facing dire food and medicine shortages. Shawkat said that the operation's advance, which includes tens of thousands of federal police soldiers, army troops and militia fighters, had been slow because Fallujah’s outskirts were littered with hundreds of improvised explosives. Before the offensive began, the Iraqi military asked civilians to leave the area — or to raise a white flag if they couldn’t. Isa Al-Essawi, chairman of Fallujah's governing council, told NBC News that 100 families — or about 600 people — had already arrived at nearby refugee camps. A medical source at Fallujah Hospital said that nine residents, including five children and two women, had been killed since the operation began. Twenty-three were injured, said the source, who requested anonymity, adding that 14 of them were in serious condition. Besides Fallujah, ISIS still controls massive stretches of territory and cities like Mosul — the country's second largest — which authorities have pledged to retake this year.